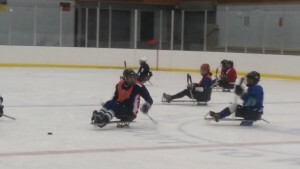 After 6 years of hosting successful sledge hockey tournaments for community members, Sportability BC will team up with the Surrey Sport and Recreation Centre to host another great opportunity for businesses and community partners to play in the 7th Annual Sledge Hockey Showdown. Every year, the Showdown brings over 100 players from around the lower mainland to have friendly matches against each other. However, by the time the championship game is played, the two teams involved will likely take on a more serious demeanor when playing for “gold”. 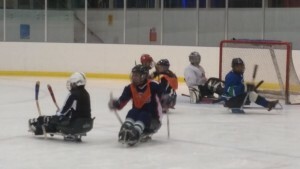 Players from the BC provincial sledge hockey team coach and show new players how to engage in this incredible adaptation of hockey. The players have coached teams such as the Surrey Fire Department, Hockey North America, Deloitte, Advanced Mobility, and the Surrey RCMP. I have coached the RCMP in the past and that was fun. Murphy Battista has made a generous donation to Sportability BC and on November 21st the firm will be putting a team together to compete in this year’s Showdown. There are still positions available on the team if you are interested in trying this exciting Paralympic sport. Check out this video from the 2013 Sledge Hockey Showdown. for more information and to get signed up for the games.